Review by Nathan Hinkle, May 6, 2014, 8 a.m.
Knog's well known for stylish lights, but I've often criticized them for putting form before function. 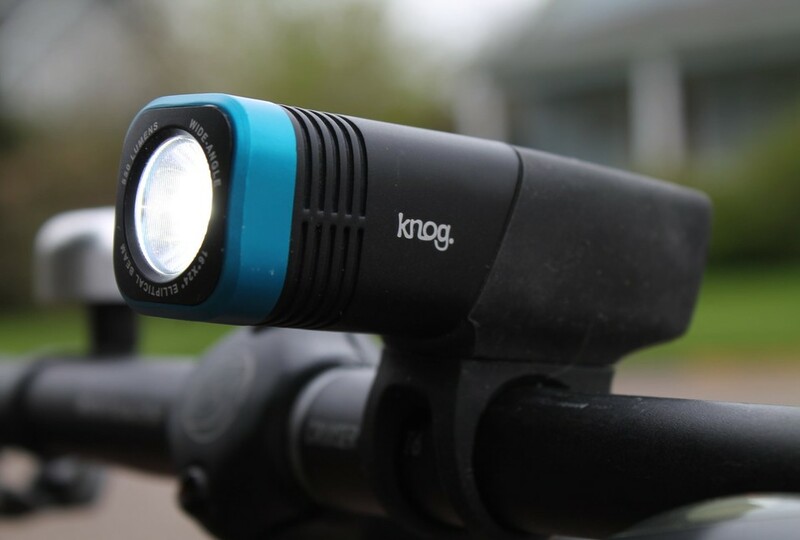 With the new Arc 5.5, Knog has finally achieved a light that is as practical as it is slick. 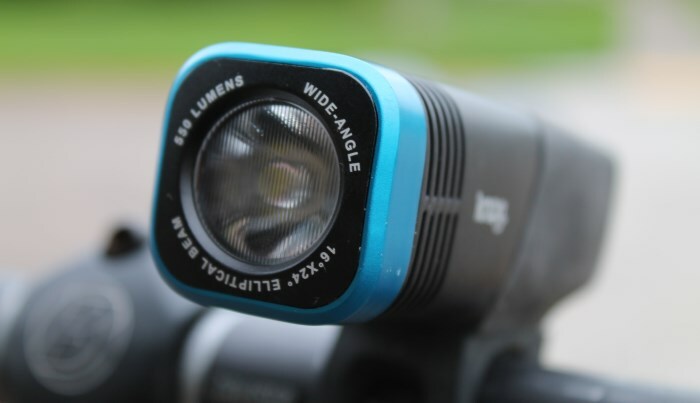 Featuring the familiar silicone housing, rugged aluminum, and smooth corners of Knog's other lights, the Arc impressed me by putting out more lumens for more hours than the preceeding Blinder Road. The optics on the Blinder Arc 5.5 are particularly noteworthy. Many manufacturers all use the same generic TIR optics with some small differences in beam angle. The Blinder Arc features a custom-designed lens that spreads the light into a wider, smoother beam that illuminates the whole roadway instead of just a single spot. You can see the difference in the beamshot overlay above. Each mode is displayed as a different color on the indicator light. You can choose between high (bright blue), medium (soft blue), low (green), and flashing (no indicator) modes on the light. When you reach about 45% battery remaining, a red low-battery indicator will turn on. Thanks to the regulated circuitry, the light output won't drop after the battery starts to run low. In my tests, the light lasted 1:35 hours, with the low battery indicator coming on around 0:50. I found the medium mode to be plenty for riding around town, and with the light on high I was comfortable riding fast on an unlit multiuse path. Measuring the light on an integrating sphere reveals that the actual output is higher than specified, coming in at 640 lumens vs the claimed 550. The Arc is mounted by a built-in silicone strap with a small magnetic clasp. There's nothing to permanently attach to the bike, which is great for those of us who need to take our lights with us when locking our bikes, or who move lights between bikes frequently. The downside is that the strap it comes with is way too big for any handlebars I tried it on. Fortunately, a smaller-diameter strap (and the required allen wrench to install it) is included. If your bike's handlebars are too small though, you could end up with a light that won't attach snugly. It's also inconvenient having to swap out the mount – I prefer a system like Light and Motion's or Serfas' where the light is still quick-releasable and no mount stays on the bike, but all adjustments can be made without tools. Side visibility is the Arc's biggest shortcoming. Essentially no light is visible perpendicular to the light. Having recently been riding with a Taz 1000 with amber side LEDs and a Streak 280 with side visibility cutouts, I felt distinctly less comfortable crossing intersections when riding with the Arc. For commuting I would likely choose a different light, or add a secondary light on my helmet with better side visibility. As with most these days, the light is rechargeable. It has a built-in USB plug that can go directly into any computer or outlet it'll fit into. The problem is that the angle can be rather difficult, and the USB connector feels flimsy. 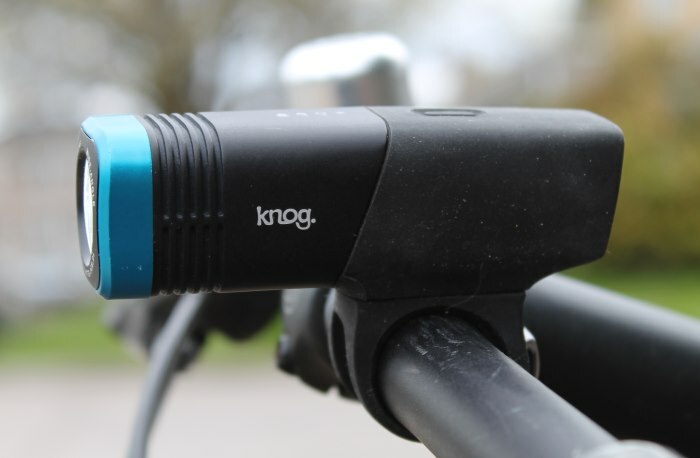 Knog thoughtfully provides a USB extension cable. Though helpful, it's necessary to fit the light into a charging port most of the time, and that necessity rather defeats the point of having the charging plug built in to the light. When I first received the test light, I attempted to plug it in to charge, but felt the USB plug twist at a weird angle. The light would never charge. Knog sent a replacement right away, and it's worked fine ever since, but the charging port is definitely a weak spot in the design. Overall I was quite impressed with the Blinder Arc 5.5. It's an excellent mix of stylish design and high-quality light output, with competitive battery life as well. Though not quite ideal for a commuter, and the charging issue is slightly worrisome, but it would be a great light for road biking, casual mountain biking, and riding on streets with minimal cross-traffic.